I really enjoy redoing kitchens for people even though it can be challenging at times. The challenge is getting the kitchen completed as soon as possible and at the same time having everything in order at home and being the happiest mom in the world doing my duty as a homemaker. Since redoing a kitchen means having everything in a disarray until it’s completed, I like to be as prompt as possible. The rewarding thing about it all is just seeing what a difference paint can make and seeing the happiness a kitchen makeover can bring! I had told myself that I would stick with only furniture makeovers this winter but a few weeks ago I was asked to redo a kitchen and I felt that familiar feeling of excitement and, of course, I couldn’t say no. I was especially excited when the owner chose to go with paint and glaze style. I had never done that before and had recently, just for fun, experimented on one of my laundry room cupboard doors. It turned out pretty good and thus became my sample door to show to my customers. The first step was to remove all the doors and drawers. I also took the recipe holder off that you can see hanging beneath the cabinets. I packed everything up to take home where I would work on it later. I then used my electric sander and sanded the cabinet frames with a medium sandpaper. After wiping them down with a t-shirt rag, I gave them a coat of paint, using a bristle brush. Later after it was dry, I gave them a second coat. Now, the countertop… I was a tad nervous about this since I never tried it before. I got a Giani Granite kit at Keim Lumber in Charm. Bombay black is the color that was chosen. This is a six step kit for refinishing any surface countertops and I absolutely love it! I would recommend it to anyone. It costs around $74.00 with tax and has very user friendly instructions included. I did add my own rules here and there, but mostly I went by the step by step instructions. First I masked off behind the backsplash and around the sink, basically any areas that I thought might be in danger of getting hit with paint. I waited a day to proceed with the next step, but since we’re on the subject, I’ll go on. There were three different colors to use (pearl, black and bronze) but I omitted the bronze. I felt with the color of the cabinets and hardware it would look better without. The final two steps were applying two clear topcoats. Back to the cabinets… When I had them at home and all laid out on tables and benches, I sanded them and wiped them clean. 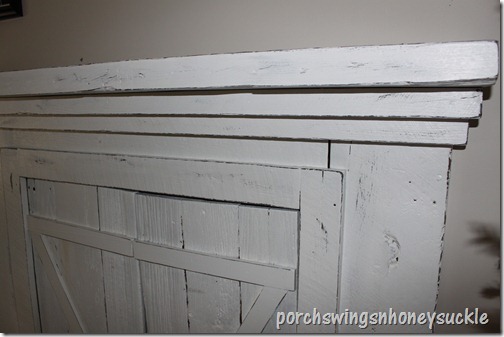 Since the doors got knobs with one screw instead of handles, the holes needed to be puttied. An old credit card works great to even out the putty. After it was dry, I sanded it. After two coats of paint, they are ready for glaze. This is a little tricky but fun. I soon discovered some ways of making it easier and felt the last doors turned out better than the first. One tip that worked for me was to not do the whole door at once and just work in sections. First I did the inside frame, only half of it at a time. Then taking a wet t-shirt rag, I wiped most of it off, making sure to keep any grooves filled with glaze. I have gotten a lot of questions on the glaze I used for this kitchen. I used a glaze by Zinsser that is unfortunately discontinued. The color of the glaze was “Olympia’s Curls” which seems to have disappeared from the formula choices. I have since used a glaze by True Value. It’s the kind that you mix with paint to color it. You can read about a more recent paint and glaze kitchen I did here. I have more detailed updates on that post. Any excess glaze I made sure to blend in and not get too many streaks throughout the doors. I’m sure there are numerous and better ways to do the glazing but this being my first time I just felt my way through. I used enough glaze that the cabinets turned out off white.With wiping a lot of the glaze off you could get a white kitchen with only the grooves glazed I think. The following picture shows the different steps I took, allowing drying time in between steps. Once all that was completed I brushed some glaze onto the center of the panel and the frame and blended that in. *The more raises on your cabinets, the better… it takes a lot of time to apply glaze on areas where there are no grooves. *If you mess something up, don’t stress…you can always sand, repaint & start over. Again, I used my trusty sprayer to apply. This can be rolled or brushed but it’s pretty fast drying so you really have to work fast and not do any rebrushing or rolling if it at all has started to dry. This was one of my most fun kitchens ever… I had nice people to work with and it gave me the chance to explore something new, which I love! If any of you want to attempt this with your own kitchen, don’t hesitate…it’s really not that hard. Feel free to ask any questions you may have...I’ll do my best to answer! I must say, I am quite tickled with the way this photo display turned out…especially considering the price. I estimated that I probably didn’t spend more than $2.15 each! The size of each piece is around 14”x7”. They are 3/4” thick. I got the pictures printed out at Staples for $2.00 each. First I dug out some old pine barn siding and for the first time ever I ran the rip saw! This was an exciting moment for me since I had never quite gotten the nerve to use it and had always just used my faithful clamps and skil saw to cut wood to length. I, or the saw rather, sliced off 3/4” strips, making the pieces 3/4” all around. I cut the wood about a fourth inch longer than the picture. I glued the frame together with my glue gun. I had stopped at Zincks fabric outlet on my way home from dropping my son off at school the other day and spent $0.75 on some odd pieces of stiff, black fabric. This worked perfectly to glue the pictures onto. Next I sprayed some glue to the front of the frame. I lay the frame onto the fabric and cut around it adding two inches on all sides. Later on, after taking these pictures, I discovered that it looks neater to iron the fabric and it also allowed me to pull it tighter. You can’t really tell by the picture, but I cut away some fabric in the corners to get them tighter and neater. You really want to pull the fabric as tight as possible all around. Lastly, I applied the spray adhesive to the photo and glued it to the fabric. This can be a little tricky since it dries pretty fast and you really only have one chance to get it even. ( mine didn’t all turn out perfectly even )The more practice I got, the better it went. I can tell which ones were ironed – they have smoother sides. I am also expecting I might have to glue the top corners since there’s a chance they might peel off from hanging. I hope you enjoyed this tutorial and will be inspired to try it yourself! Thanks for visiting!